Transportation of immigrants, your belongings, furniture, pets, cars to / from CIS countries, Europe and Scandinavia. International moving companies worldwide movers. We are the only experienced transporter of immigrants to / from Belarus, Russia and Ukraine. We provide a complete range of services: departure to client to define the most convenient and profitable transport to fit you and your cargo. Door- to-door delivery. Assistance in border crossing document execution, knowledge of all customs laws. Choice of vehicle depending on the amount of your belongings . Our stevedores will carefully prepare your belongings for transportation, gently load to deliver them in the same state they were before the transportation. We will provide prompt and comfortable relocation to any place. Positive testimonials from clients and recommendations. A good knowledge of the the CIS roads. Flexible price offers for immigrants. 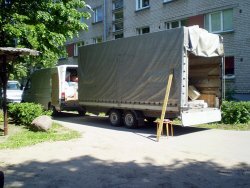 We provide moving services in the following countries and cities: Latvia, Belarus, Russia, Europe, the Baltic States, the CIS, Scandinavia, Estonia, Lithuania, Poland, Germany, Holland, Denmark, France, Spain, Switzerland, Austria, Luxembourg, Italy, Slovakia, Slovenia, Czech Republic, Hungary, Croatia, Bulgaria, Greece, Turkey, Finland, Sweden, Norway (St. Petersburg, Moscow, Novgorod, Pskov, Sebezh, Velikiye Luki, Kursk, Ryazan, Smolensk, Bryansk, Belgorod, Voronezh, Volgograd, Rostov, Samara, Saratov, Kazan, Yaroslavl, Riga, Daugavpils, Liepaja, Ventspils, Minsk, Brest, Gomel, Grodno, Kiev, Odessa, Kaunas, Vilnius, Tallinn, Tartu, Narva, Warsaw, Budapest, Prague, Vienna, Bratislava, Rome, Milan, Naples, Geneva, Zurich, Paris, Barcelona, Madrid, Bryusel, Amsterdam, Berlin, Stuttgart, Munich, Hannover, Bremen, Hamburg, Frankfurt, Düsseldorf, Dortmund and others).